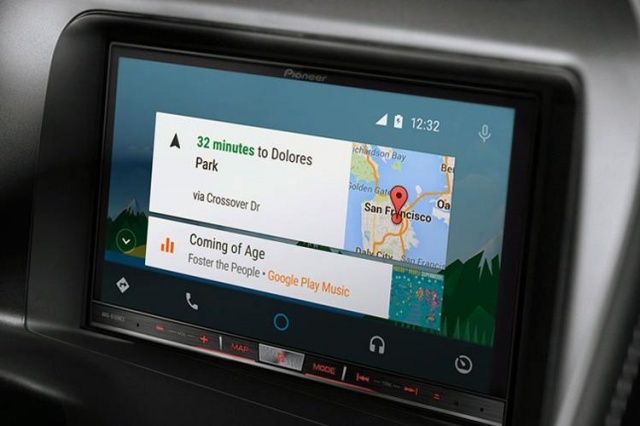 Google unveiled the Android Auto at the Google I/O in 2014. It lets you connect your Android 5.0 Lollipop devices with the dashboard head unit in a car and add smart features to your car. Google is now ready to bring the Android Auto to the market, and they have introduced the feature with three Pioneer head units. Pioneer has introduced AVIC-8100NEX, AVIC-7100NEX and AVH-4100NEX dashboard head models which feature Android Auto integration. Users can connect their Android Lollipop devices directly with the Pioneer head units and will have access to a simple user interface that lets them access features from their phones. The simplified in-car interface is also voice activated so that the driver can always have his eyes on the road. Android Auto adds smart features to your car. With Android Auto, you can make a handsfree call, play audio, control an app and, of course, use Google Maps for navigation. The platform also reads messages for the users as well as lets them send texts through speech-to-text feature. To use these features, users would have to install the Android Auto companion app, and they are good to go. The app lets users choose which services they want to access on their dashboard units. The top Pioneer head unit model, AVIC-8100NEX features a capacitive touchscreen and is priced at $1400. The AVIC-7100NEX is priced at $1200 but features a resistive touch screen. Both these models come with onboard navigation system so they can be used even without pairing with the car. The AVH-4100NEX is the most affordable of them all with a price of $700, but it doesn’t have any navigation features, but you can easily use Google Maps on your phone for that purpose. Google’s business nemesis Apple has already brought the CarPlay, which offers iOS users with the same features as the Android Auto. Apple is proactively partnering with car makers to include CarPlay into their vehicles and has managed to get most of the major brand interested in the technology. But considering the humongous influence of Android in the smartphone market, you can anticipate more Android Auto ready systems would arrive soon for a wider range of vehicles. The humble car is finally ready to be a part of the digital age.